In this exclusive Maureen Wood, psychic medium interview, LTK delves into séances and ghost hunting. Maureen's experience and skill as a psychic medium aids her in communicating with spirir. Maureen Wood is a fifth-generation psychic trance medium who says she has been able to communicate with spirits since childhood. "I just never thought it was anything, extraordinary," Maureen explains. "While growing up, my mother, not wanting me to feel different, often told me that I was normal. Then she would hand me a bottle of holy water for protection," she adds. It wasn't until Maureen was a teenager that her mother revealed that the women in her family were born with the ability to heal, stop bleeding and conduct psychic readings for people. Maureen helps the living by validating ghostly encounters and the dead by assisting restless spirits find peace. "It's my belief that I'm giving that spirit a chance to release whatever it is they are holding on to," she says. " By letting go of the denser energy, anger for instance, spirits can choose to stay, or move on to that better place." It took time for Maureen to gain control over her abilities. By the time she was fifteen, Maureen says, "My abilities were in overdrive and I had no idea how to stop the onslaught of images cascading into my consciousness." When she had a precognitive daydream about a local mill catching on fire, she told a friend. The mill caught on fire two days after Maureen's premonition. Her friend's mom contacted a neighbor, Carol, who was a Wiccan and had studied with Laurie Cabot, the official witch of Salem. Carol asked if she could evaluate Maureen's abilities. Maureen was apprehensive. "I was about to be tested for my so called psychic abilities. What if I failed? Would she tell me that my mind was as brittle as it felt?" Carol guided Maureen into a meditative state of mind and asked her to describe someone named Ali. She gave Maureen Ali's last name and street address. Maureen says, "After a bit of prodding, I blurted out a brief description of the images flashing through my mind like thumbing through a picture book." She was uncertain about her accuracy until she opened her eyes and found Carol smiling at her. Next, Carol took Maureen to Ali's house. Inside, Maureen found nine-year-old Ali, exactly as she'd described him. "He was strapped to a tall red wheelchair. His frail torso bobbed at the waist as pale arms struggled for a ball just outside of his reach. A lump formed in my throat as I walked over and inched the ball towards him." Carol introduced Ali as her son. Afterwards, Carol began teaching Maureen how to control and harness her abilities. "Looking back to those days, I am very much aware of the synchronicity of the Universe and the solidification of my beliefs, that everything does in fact, happen for a reason," Maureen admits. Months later, Maureen began conducting séances. "I used a combination of spirit communication and automatic writing," she explains. "The messages were slow in coming, then one day it was as if someone turned on the Karmic faucet! Messages for those attending the séances poured forth from their loved ones. That's when my friend expressed concern for my well-being." One night on her way home after a séance, Maureen felt a swirling sensation in her third eye region and the strong presence of a spirit sitting beside her. "Suddenly, I felt a soft pressure on my right cheek and what felt like invisible lips kissing me," she says. In the meantime, her friend had told his mom that he didn't believe in ghosts and felt his mom was pushing Maureen into doing séances. As soon as he'd spoken, the refrigerator lifted six inches off the floor then crashed back in place. "To this day, he swears he'll never disbelieve again!" Maureen laughs. "The spirits tend to stick up for me. It can be unnerving to some, I think it's sweet." Maureen continued to conduct séances for the next three years, then stopped. "Although I had been trained by my mentor in ways to protect myself, I never truly understood the depth of what I was doing and the havoc it could wreak on my life," she says. It would be twenty-five years before she conducted another séance. 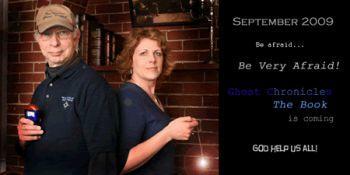 LTK: When and how did you become involved in ghost hunting with the New England Ghost Project (NEGP)? Maureen: I'd been doing readings, energy healings and teaching metaphysical studies for more than twenty-five years when I read an article about the NEGP in a local newspaper." She contacted the founder, Ron Kolek and accepted his invitation to join the group on an investigation. "Since that was more than eight-years ago, I suspect he liked the idea of having a medium accompany his team," Maureen says. LTK: How many members are on the team and what is your role? Maureen: We have a core team of eight. However, we also have a research arm, a web designer and various members of the team assist during investigations. I'm the psychic investigator/trance medium. Ron is the paranormal scientist and uses an EMF (Electro Magnetic Field) meter, temperature gauge and other equipment to measure environmental fluctuations. We have an EVP (Electronic Voice Phenomenon) specialist, a photographer, a base camp monitor, and a tech specialist who sets up the vast amount of computer equipment needed during each investigation. LTK: What kind of equipment do you use? Maureen: I use a pendulum to spiritually dowse for yes, no and maybe responses to various questions asked as we communicate with the spirits. Although I'm psychically picking up information, the pendulum acts as a visual device for anyone attending the investigation to see the response to questions." LTK: Do you do anything to protect yourself while investigating? Maureen: I communicate with my guides and ask the angels for protection, especially Archangel Michael. When I step into an investigation site, I open myself up by mentally communicating with any spirits present. There is still a small level of risk associated with every investigation. Having a strong faith and knowing I am protected gives me the courage to persevere. I often bring along numerous methods of protection: protective stones (black tourmaline), rosaries, holy water, liquid sage, and coins (metal for grounding). Although I consider myself strong and protected, I am not foolhardy. I consider the extra protection like peeling away an onion. If a spirit tries to hurt me, they will need to break through the layers. I use my abilities by mentally reaching out to contact spirits during a paranormal investigation. When I make contact, the rest of the team joins in by taking temperature readings, infrared photos, EVPs, and so on. Later, we compare notes and various data compiled during the investigation and decide where to go from there. LTK: Does any single investigation stand out that had a personal impact on you? Maureen: Portsmouth Lighthouse, in Portsmouth, New Hampshire, where I channeled the spirit of a sweet elderly woman, Connie Small, who died of natural causes. She was the last lighthouse keeper's wife and passed away at the age of 103. Her spirit was intent on getting messages through. I remember her excitement as her thoughts and emotions danced around my consciousness. Roxie, a friend of Connie's, attended the investigation. Connie thanked Roxi for the beautiful bouquet of pink flowers. Roxie suddenly overwhelmed with emotion said that pink tulips were Connie's favorite flower, but being January, it had been difficult finding any for the funeral, but she had. Just before the casket lid was closed, Roxie tucked the bouquet inside with Connie. Roxie turned to look around the room as if gauging everyone's reaction. "It was only my husband, the preacher and me that were present." Months later, I came face to face with Connie as I attended a presentation where details of our paranormal encounters were being shared. I brushed back tears and spoke past the lump forming in my throat. It was the first time I'd had the opportunity to come face to face with a spirit I'd channeled. And it was amazing! In concluding this Maureen Wood, psychic medium interview, be sure to listen to the live paranormal radio talk show, Ghost Chronicles, that Maureen co-hosts with NEGP's founder, Ron Kolek on TOGINET Radio every Wednesday at 8 pm EST and Para-X. 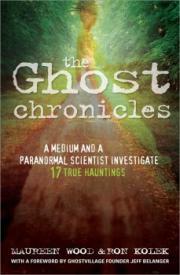 You can read about the ghostly encounters of Maureen and Ron in their book, The Ghost Chronicles: A Medium and a Paranormal Scientist Investigate 17 True Hauntings.